I married into Irish heritage. This week I am traveling for work, so I can’t tackle the traditional corned beef and cabbage celebratory meal that embraces this holiday. Nor do I really have any desire to, actually; ability aside. But over the weekend, my Greensgrow CSA share challenged my inclination (please see the end of this post for additional CSA provisions). Along with pea greens, yellow onions and applesauce, a head of cabbage wiggled its way into the mix of produce. 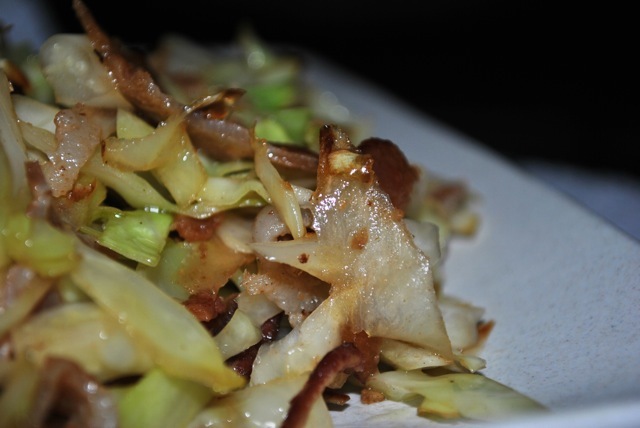 I have never cooked or prepared cabbage, and cole slaw seemed like a promising introduction. But with my strong aversion to mayonnaise, I opted for a different fat source to coat this vegetable – bacon. Just a little, it’s all you need. In the end, my toast to Saint Patrick actualized in the form of a cabbage slaw with a kick-back to its original pairing with bacon – the way the Irish intended. Please click on hyperlinks for information on local purveyors. 1. Shred cabbage and radish and set aside. 2. Melt 2 tsp of butter in a sauce pan over medium-low heat. Add 4 slices of bacon and cook for about 2 minutes on each side. 4. In the same pan the bacon was cooked in, add the shredded cabbage and radish. Cook for about 5 minutes on medium-low heat, tossing frequently to ensure slaw is coated. 5. Remove vegetables from pan. Chop bacon and toss with slaw mixture to combine. In preparation, I worried that this recipe may be a bit dry as I was a bit miserly with the amount of bacon fat I left in the pan (that’s the dietitian in me). However, the bacon flavor ruminated throughout the vegetables, much stronger than I anticipated. This slaw is tasty on its own, and, of course, would certainly go well with corned beef.